Flip Out Mama: Awesome Baby and Toddler Sleepwear from Halo! Awesome Baby and Toddler Sleepwear from Halo! I'm really excited to introduce you guys to a new line of Sleepwear from the wonderful folks at Halo! The whole point behind the new Comfort Luxe Sleepwear is to keep babies comfortable. Because we all know, if baby ain't happy..... well, you know the rest! The Comfort Luxe line is made of an innovative fabric that outperforms cotton by wicking away moisture and helps to regulate baby's temperature. Breathable, and drying twice as fast as cotton, it really is revolutionary. So revolutionary, in fact, that Halo's Comfort Luxe Sleepwear has been awarded The Seal Of Acceptance from The National Eczema Foundation. That's a great accomplishment! We received a pair of these PJ's for Tater to try out! I was so excited, since I have been a fan of Halo since I received one of their Sleep Sacks many moons ago! I knew I would be impressed with these! The first thing I noticed about these jammies is the fabric. It's really something different, and a little weird at first. It's really a light and breathable fabric, that is really silky and smooth, without being actually "silky." (Makes no sense, I know!) I was a little worried that my Fat Tater would be too hot in these jams, since usually he rips them off within a couple hours of going to bed. Much to my surprise, it is three hours into Tater's night, and his jammies are still on! Yay! This is well past the usual time frame for getting hot and itchy, so I am impressed with these pj's! They are a really good quality, which of course I was expecting from Halo, and after the first wash they still fit perfectly and are as bright as before! I love the cute little puppy on the front too! They have sizes up to 4T, and come in a coverall and two piece set, so whatever your little one's preference, they will be able to sleep well! I was also really excited to learn about Halo's Base Layer, also made from the Comfort Luxe material. The Base Layer is the perfect accompaniment to the wonderful Sleep Sacks from Halo. This is the perfect way to make your little one sleep well! I always had a hard time wondering what my babies should be wearing under those Sleep Sacks, and I've got it now! Thanks again Halo, you have impressed me like always! 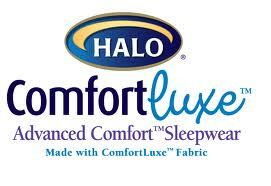 You can find your own Halo Comfort Luxe Products at Amazon.com, BabiesRUs, and BuyBuyBaby! Be sure to check out Comfort Luxe's Facebook Page for more info! disclosure: I received a sample product in order to conduct this review. Although a sample product was received, all opinions are my own and no monetary compensation was given. Summer Fun: Energizer Carbiner Light! Fathers Day 2011: Insane Chicken Hot Sauce. Father's Day 2011: Sticky Fingers BBQ Sauce! What A Super Sucky Week. Summer Fun: Nomad Footwear Review and Giveaway! Domino's Pizza Gift Card Giveaway! Summer Fun: Flojos Review and Giveaway! A Sad Day Here At The Ranch. Spoil Your Baby With My Blankee! Summer Fun: Travel Games From Hasbro Games. Clairol Color Blend Foam= Home Hair Color LOVE! Celebrate Cinco De Mayo With Chili's!